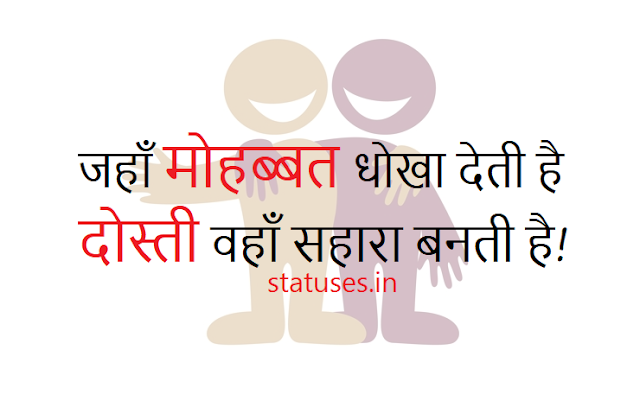 Dosti Status | Friendship is one of the beautiful things god gifted us. If you're looking for 2 Line Short Shayari on friends then you're at right place here i've posted 70+ 2 line dosti status for you. मगर जिनसे हो जाती है वह लोग ही स्पेशल हो जाते है !! वरना लिखेंगे इतिहास ऐसा पढना मुश्किल होगा..
हमने चाँद रोका है एक रात के लिये..! मैने कहा, प्यार साथ दे न दे, यार साथ हैं !! Vo Puchte Hai Itne Gam Me Bhi Khush Kaise Ho? Maine Kaha, Pyaar Sath De Na De, Yaar Sath Hai !! Unllke family memebrs we choose our friends on our own. So these were popular yaari dosti status, i hope you liked them and shared with your friends. Read more of our other collections at statuses.in and you can bookmark this page to read it later without searching it anywhere else. You can comment down below your selected status or any other status you want to share.